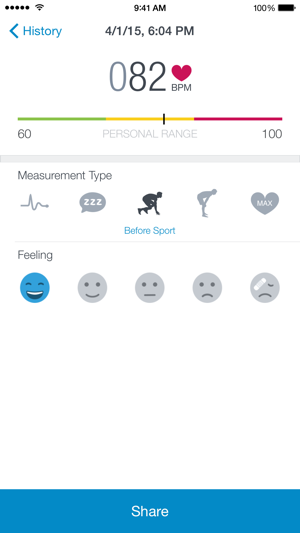 Test your HEART RATE right from your iPhone - unbelievable? Just try it out! Your pulse is racing, your heart is in your mouth: It’s easy to determine your physical or mental condition based on your pulse - and not only when you’re excited. 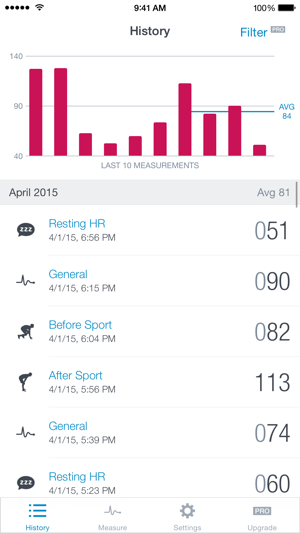 Measure your heart rate when you wake up, after a training session or before your next exam. 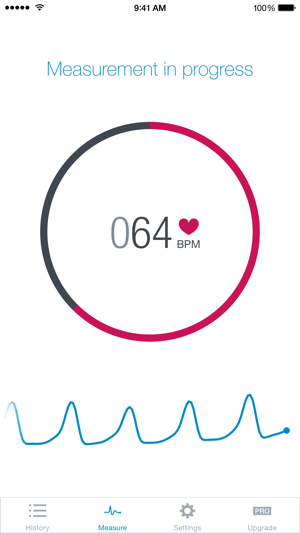 Runtastic Heart Rate shows you how fast (or slow) your heart is beating at any given moment, no extra devices needed. Your iPhone will do the job. If knowing your pulse rate is critical to your health, you need to have your pulse taken by a medical professional. Heart Rate Monitor is not intended to diagnose, prevent or treat any condition, or to be a substitute for professional medical care. Measurements and statistics are intended for informational and educational purposes only, to support general health and wellness. The Heart Rate Monitor app has not been tested with individuals with health conditions and has not been cleared or approved by the U.S. Food and Drug Administration. I've had insomnia for quite a while now and wanted to see what my heart rate was when I was up and around vs. in bed. I downloaded this app and wondered how it actually worked, so I googled it and to my surprise these apps do work as intended, but can be off by +/-1.5% or so. Technology's awesome. I only realized how truly great it is when recently I've been trying different medications. One of these side effects I've been having is anxiety attacks. I'll get in bed with a rate of around 70, it'll drop down to around 60 a little later, then I felt an attack coming on and just had to wait it out for a few hours. I checked it when it was at its peak and was amazed when I saw it at 120. I woke up later at 7am and was back down at around 60. Summary... this truly does work and is probably one of the most amazing apps I've ever used. I'd give it 5 stars, but I gave it 4 because like others have said as well, they need to stop the signup screen showing up first thing on every launch and they also need to stop showing the ads in the way they do. I have no problems with apps with video ads, but I do get frustrated when I want to see my heart rate right away, but a 30 second video ad shows. I'm frustrated for that small amount of time, but that goes away when I can start using it. Ads after purchase? Very difficult to use.. I bought the app, it works well but why do I *keep* getting ads?? It's makes the app very difficult to use because my eyeglasses fog up when I exercise and I don't wear contacts. I want to track my heart rate at the "Max HR" & immediately after exercise (and save the reading with the tag that says "after sport" or "Max HR"). But when I see an ad instead of the monitor, I often accidentally press the wrong thing. Then, I have to stop what I'm doing, walk over to my bag, get my glasses, exit from the ad, and by then it's too late to take my heart rate "after sport" or at "Max HR". Not what I expected. I used to love this app, until I upgraded to my 8+. The way the camera flash & lens are designed on the phone quite different from my 5S (wider), which isn’t an issue. The issue seems to be the app not getting a reading. I make sure my finger is covering them both properly, but still keep getting the instructions pop up. Not sure what the problem is. I have small hands; not enough of the tip of my finger? Not much I can do about that with a bigger phone. Perhaps some software tweaks are in order.